This summer, STUDIOKCA Architects, Lesley Chang and Jason Klimoski won the competition called City of Dreams, to create an installation for Governor's Island in New York for the summer of 2013. 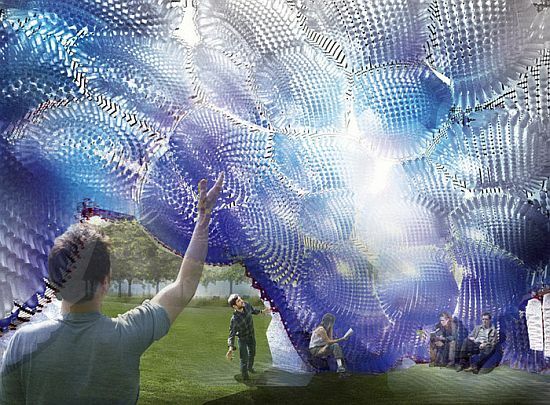 They've come up with using 53,780 throwaway plastic bottles (which is apparently the amount that NYC consumes and do away within just one hour) to design a cloud shaped pavilion entitled, Head in the Clouds. Have a watch at their Kickstarter pledge (video featured above) to learn more. And to make a contribution to the project, go HERE.